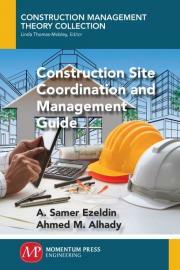 This book provides construction practitioners with the knowledge they need to successfully coordinate and manage construction projects. It highlights different construction processes required to enhance their practical performance in particular and further the construction industry in general. Dr. Ezeldin is a professor and chair of construction engineering at the American University in Cairo. Dr. Ezeldin has published two books, six chapters in books, and more than 85 referred journal papers, and papers in conference proceedings. Dr. Ezeldin is a licensed professional engineer in the USA and his professional experience has encompassed a varied range of activities, including consultation for engineering and project management, specialized training, academic teaching, and highly technical funded research. Dr. Alhady is a program management specialist in the field of civil and construction engineering projects with extensive experience in the rural and community development with regard to irrigation improvement schemes. Dr. Alhady is a certified construction project manager since 2005 and has taken part in and supervised many civil engineering projects related to residential and commercial buildings, water pump station plants, and irrigation structures funded from different international organizations such as World Bank, JICA, OPEC, FAO of United Nations, and many more. Dr.